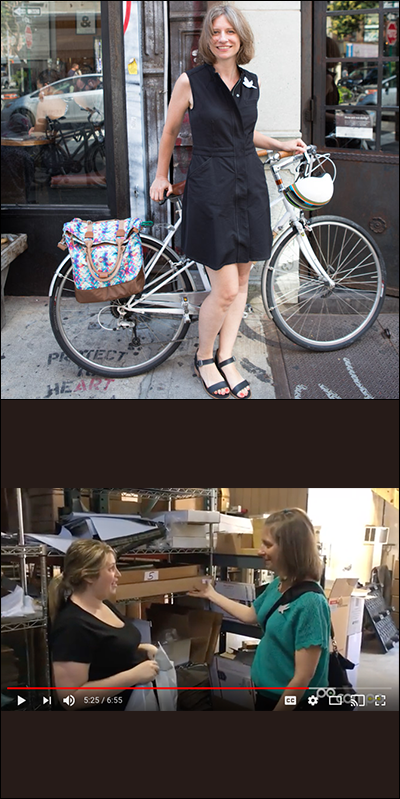 The “Quest for Sustainability” is my side project, a video series that documents my journey in creating a more sustainable line of bike bags. Po Campo makes bags that make it easier to carry what you need on and off your bike with style and ease. We know that one of the main reasons our customers opt to bike for transportation is because it is good for the environment, so should the products they’re using also be as good as possible for the environment? To that end, I started working on a line of eco-friendly bags and quickly had lots of questions. One of the realities of sustainable design is that there is no singular path to sustainability; in other words, there are many roads that you can take, where improving in one area can mean worsening in another. As I was navigating these trade-offs, I was reaching out to other people to help gain some perspective. I found the journey to be really interesting and, wanting to invite our community along on it, started a video series called the “Quest for Sustainability.” Each week, I post a video of me tackling one aspect of the process, and I’m looking for people to comment about what they’re interested in and what means the most to them. I know video projects can be time-intensive, so I hired a video-editing intern to help me with the project. I try not to get too obsessed with the production value on the videos, instead opting for a rawer, more intimate look that I can produce more easily. But, between lining up the interviews, reviewing footage and promoting each episode, it has certainly spilled into the evenings and weekends. I think it’s the creative person in me that always wants to make something new, discover something new. Even though Po Campo adds new products all the time, I was yearning to branch out a little and challenge myself. Maria Boustead also shares her thoughts on launching a product-based business as part of my interviews—101 so far—with independent Makers. And read more about the joy of side projects.